Each Boxing Fighter is driven by two independent gearboxes. Each gearbox transfers movement to both its associated foot and arm via crank plate and linkage rod, causing the arm to punch as the foot propels the unit. Each gearbox is controlled by a corresponding lever on the two-channel remote control, which means you can move your fighter forwards or backwards while turning to the left or the right. In no time you will be able to make your boxing fighter go anywhere you want. 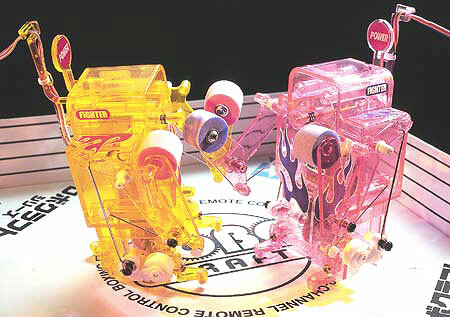 The fighters’ bodies are made from transparent yellow and pink ABS resin that allows you to see all of the motors, gears, cranks, and linkage rods in action. Gearboxes, motors, and two remote-controls included. Stickers for customization of fighter appearance are also included. The product’s box has been specifically designed to serve as a boxing ring. Requires two AA (a.k.a. R6 or UM3) batteries (sold separately) for each Boxing Fighter (i.e. four AA batteries total). Hitting your opponent in the mouth will make the judging plate lower. When your opponent’s plate is completely lowered, you win the fight. Check out the Tamiya 71110 Boxing Fighter for more ways to play. This set comes with stickers that let you customize the appearance of your fighter, and the product’s box has been specifically designed as a boxing ring. Note: This is a kit containing one yellow and one pink fighter (the blue fighter shown in some pictures on this page is sold separately as a single unit). Assembly requires using a screwdriver and snapping parts together. No soldering is required. Run on flat, smooth surfaces; avoid running over slopes, on bumpy roads, or on thick carpet.